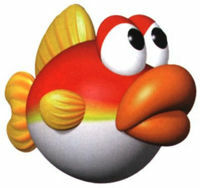 Blurps are a species of giant carnivorous Cheep Cheeps found in Jungle Puddle in Yoshi's Story, acting similar to Boss Basses and Cheep Chomps of other games. They are split into two color variations, the Red Blurp and the Blue Blurp. Red Blurps are particularly similar to Boss Bass, and watch their prey from the water before attempting to eat their prey whole by jumping high out of the water with their large mouths open. They will also chase a Yoshi should it fall in the water. However, they are slower than Boss Bass both in the water and in the air and don't jump as often, instead taking somewhat long breaks between jumps, but are much larger, have a much larger range, and are able to aim their jumps. Blue Blurps, on the other hand, stay in the river. However, they spray water above the waterline similar to Spray Fish, but done in large bursts instead of a continuous thin stream, and like the Red Blurp, can aim their attacks in various directions. Also like Red Blurps, they will pursue any Yoshi that falls in the river. In Mario Golf, either a Bubba or a Red Blurp will jump out of the water if the ball lands in it. They are much smaller in this game. Blurp is also the theme of Mario's Star Hole 4. 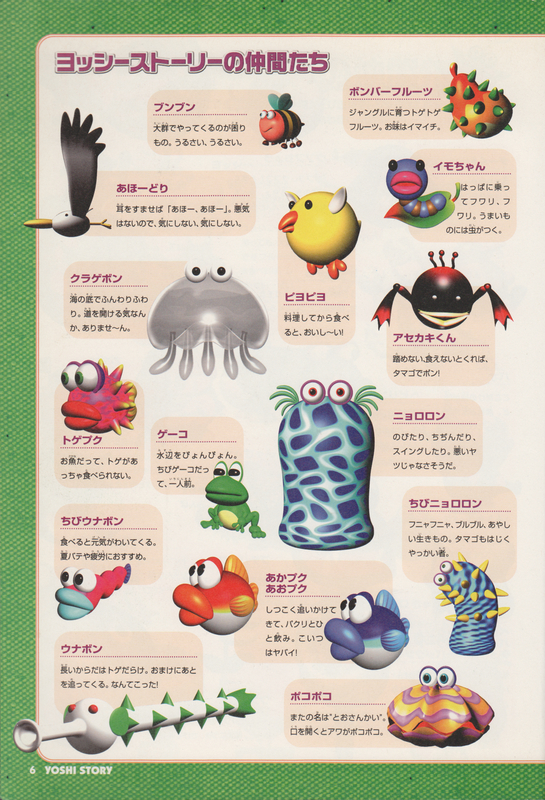 ↑ 4.0 4.1 「ヨッシーストーリー 任天堂公式ガイドブック」 (Yoshi's Story Nintendo Kōshiki Guidebook), page 6. This page was last edited on January 20, 2019, at 18:28.